Normally, when someone says they’re on a dock pattern, they’re hitting dozens if not hundreds of docks in a day. 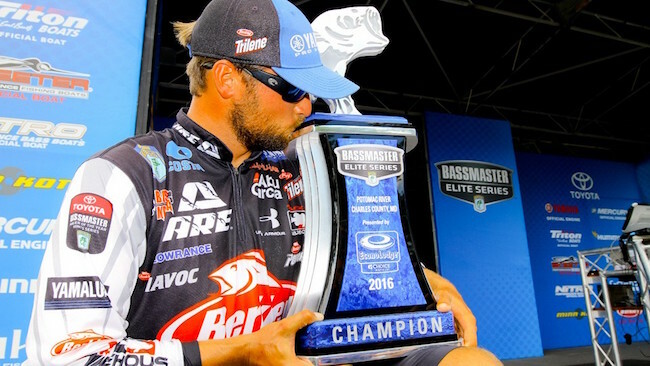 Justin Lucas just needed one to win the BASS Elite Series event on the Potomac River. It was a long parking dock adjacent to a water treatment plant on the upper end of the river. Even more interesting is that every pro in the field knows about it, as it’s a true community hole. Yet, there was Lucas fishing it all to himself, and after four days, Lucas had his second Elite Series victory in as many seasons. Yet this one was special, as it was his first tournament victory ever outside the state of California. Lucas has long been one of the best young anglers in the sport. He has a stretch last year where he made five top 10s in six events. He also have been ranked in the top 10 of our Majors Ranking. That said, a couple really bad tournaments sit on his record right now. Still, his success over the weekend bolstered him back into the top 30, as he currently sits in 28th. Let’s shift gears to another angler who made the top 10 this weekend and has quietly been in the top 10 in the rankings: Keith Combs. A week ago we wrote how FLW Tour anglers held the top four spots in the ranking. Not anymore. Combs has overtaken John Cox and now is in fourth, and he’s only three points behind Andy Morgan for the No. 1 spot. Combs is yet again in the hunt for Angler of the Year, and if it wasn’t for his hiccup at Bull Shoals he’d probably be running away with it. Same could be said for the rankings. The rest of the rankings had some minor shifts at the top, but nothing too significant. Brent Ehrler is looking to get back into the top 10, as he moved up to 16th. Randall Tharp is back in the top 20 at 19th. Jason Christie’s runner-up at the Potomac has him just outside the top 30, in 31st, as Bill Lowen’s fourth place finish bumped him to 30th. Andy Montogomery made the most significant move, though, jumping from 54th to 42nd after his top five this weekend.